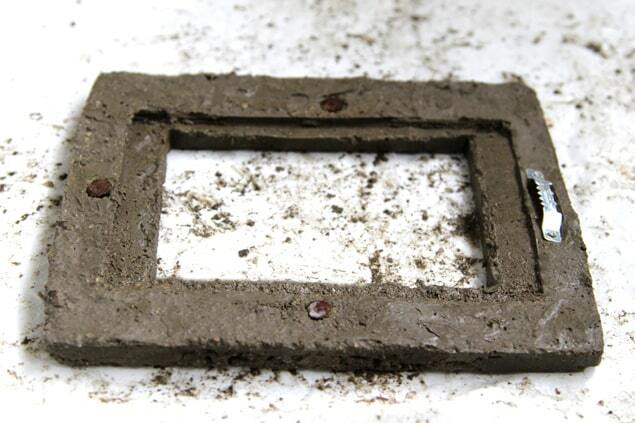 I bet you have wood picture frame, metal picture frame, but what about CONCRETE picture frame?? 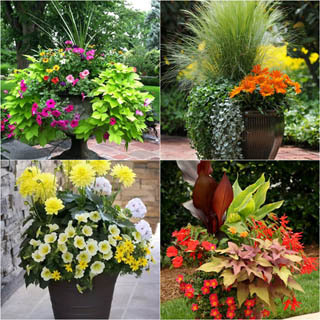 Imagine how cool it would look with our geometric concrete wall planters?!? Concrete is such a fun material, it’s easy to work with, and can add such a unique touch to your home decor. 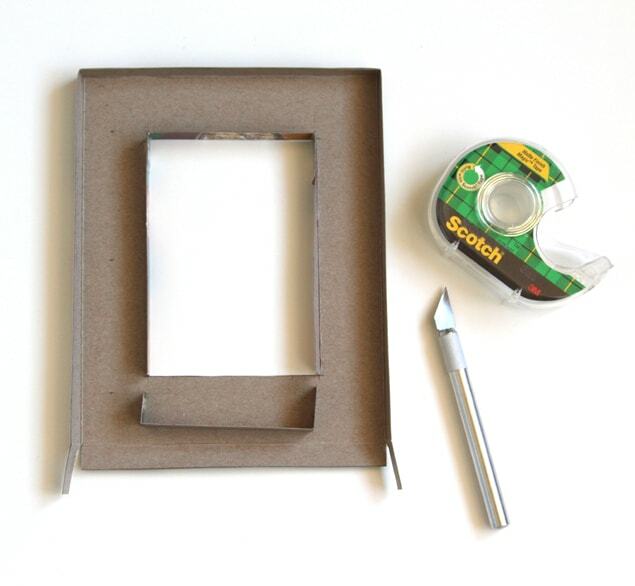 Once you learn the basic steps, you can shape it to any form you want as well, like an oval picture frame perhaps? 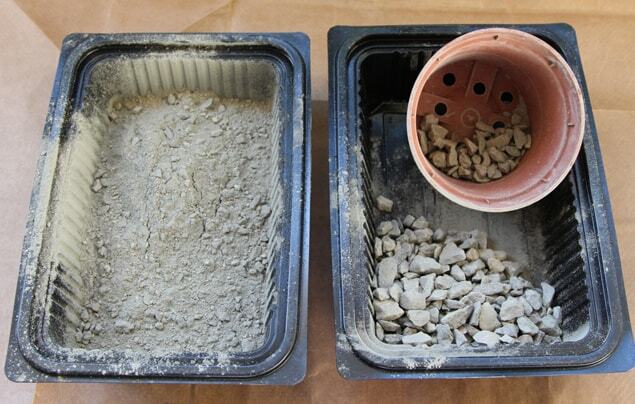 The aggregates give structures that hold the cement together in concrete. 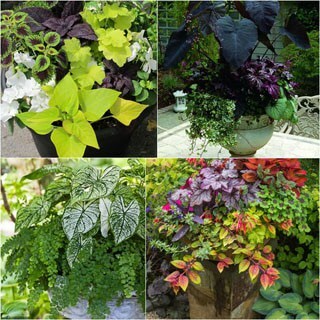 Because the frame is about 0.5″ thick, we will screen those bigger chunks of aggregates out of the Quikrete 3000lb mix- a plastic nursery pot works great – and leave some smaller aggregates for strength. 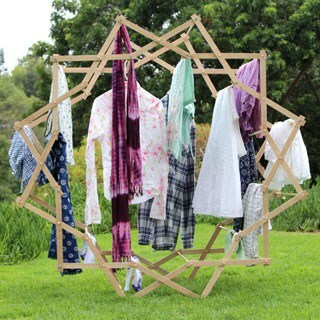 First decide the size of the frame. 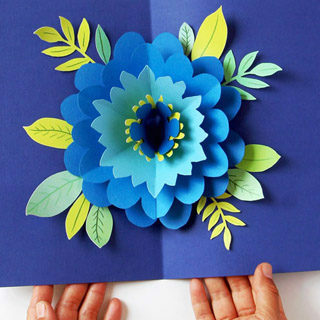 It’s a good practice to start with a smaller one, such as 5″x7″ to get familiar with the process, then go on to 8″x10″, etc. 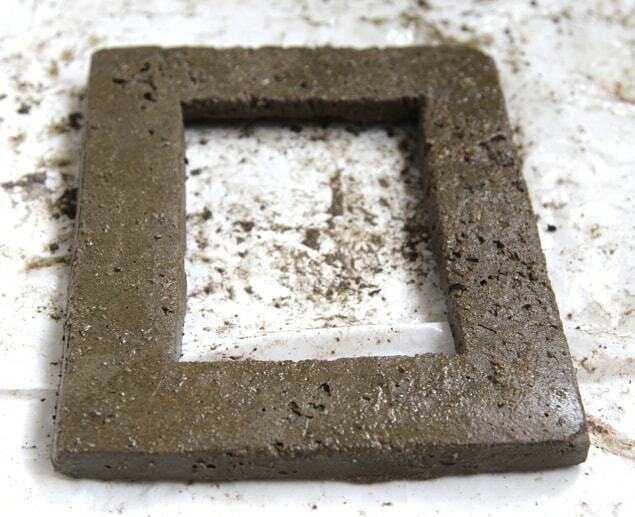 Because of how strong concrete is after proper curing(more on that later), the thickness only needs to be 0.5″! 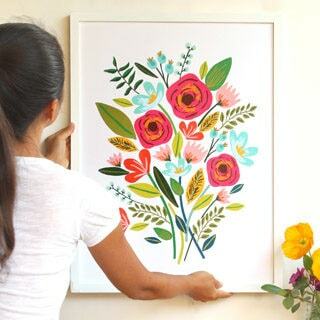 Draw the face of frame with the opening – if you use 5″x7″ standard glass, then draw the opening at about 4″x6″, the width is up to your artistic decisions. Score the lines where it needs to be folded, and cut the rest. You may need to cut some additional pieces and tape them together to complete the mold. Also cut some pieces at 0.5″ wide and tape along the sides to use as additional support to prevent bulging. Add water to the screened mix, and use the recommended proportions on the bag. The consistency should be like a very thick oatmeal – but don’t taste it! =) Pour into the mold until it’s 1/8″ from the top rim, and place the pieces for the glass onto the concrete. Then pour the rest of the concrete till it’s level with the rim. 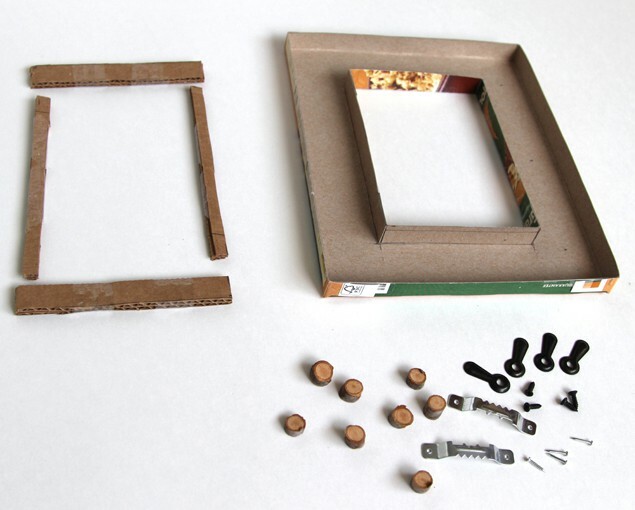 gently press the small nails with the picture hanger (use some cardboard to ensure a gap), as well as the little wood pieces (for the turn button later) into the mix as shown. If you look at the back of a picture frame, there needs to be a recessed area to hold the glass. 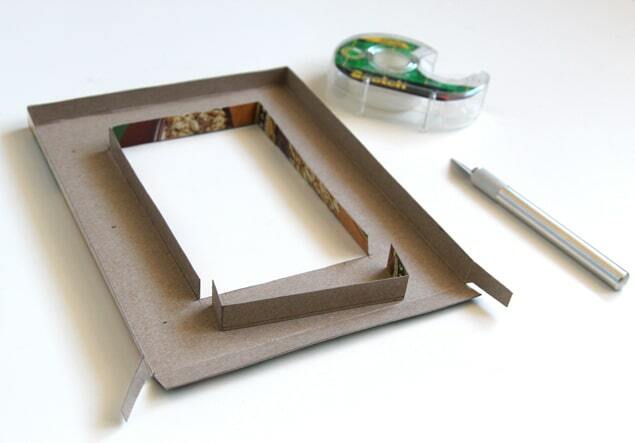 We will make some pieces about 0.5 wide and 1/8″ thick – cardboard is great for this – to create that recesses area. This is a very important step to ensure that the concrete hardens as much as possible so they don’t chip or break. Let the frame stay in the molds and cure for at least 3 days by misting them daily and wrapping them in plastic bags. The more moisture you can keep in the plastic bag the better. After day 3, take the frame out of the mold, rinse it and let dry. 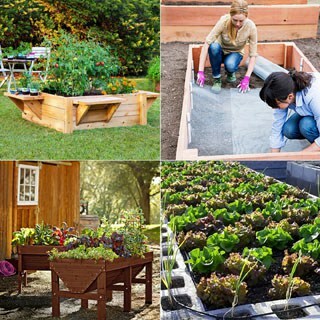 If the wood pieces are a little loose, use some glue to secure them in place. 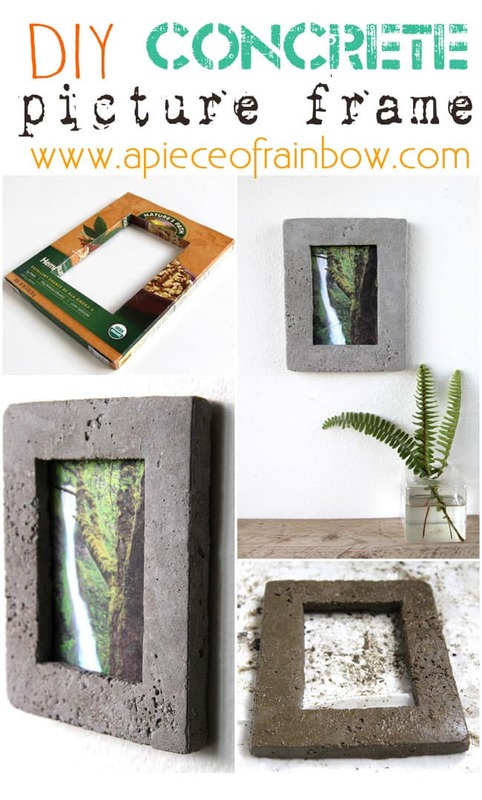 Attach the turn buttons onto the wood branch pieces with screws, cut the card stock backing to size, and now you can display your pictures in a modern concrete frame! Love picture frames? 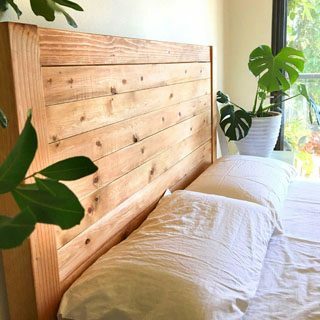 These beachy fence wood frames are inspired by reclaimed boat wood! 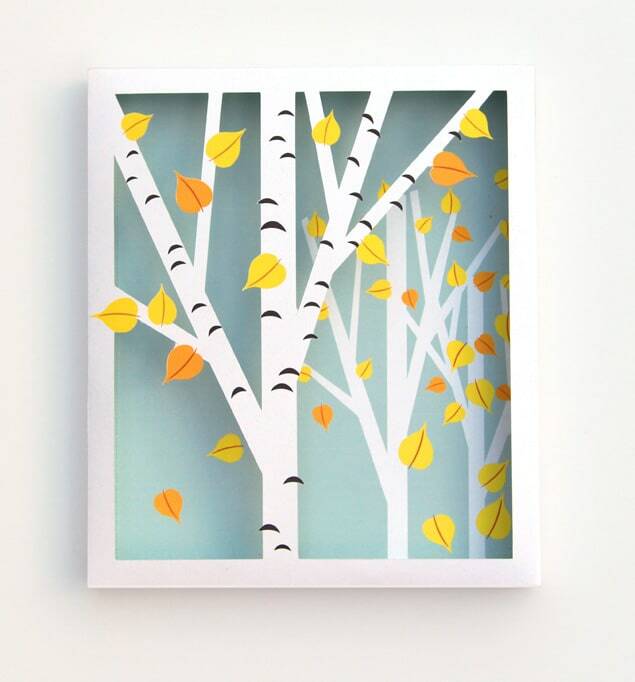 Another fun wall decor idea you may like is a birch forest shadow box made from 2 pieces of paper! 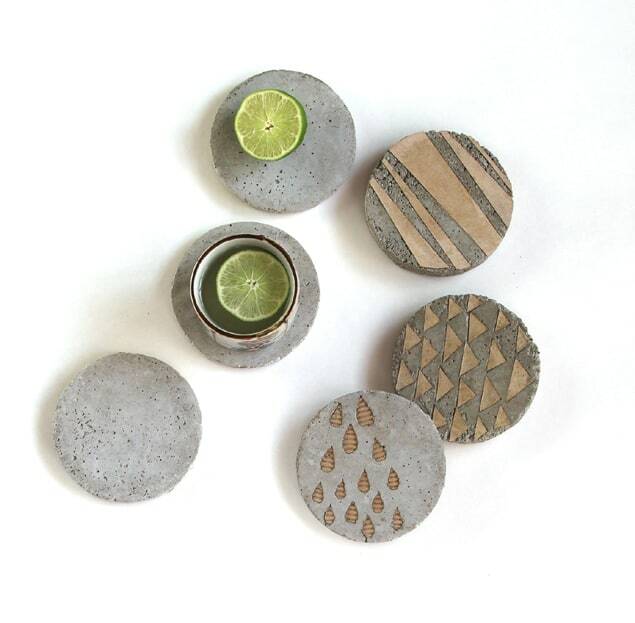 How about some cool DIY concrete coasters as great conversation pieces? 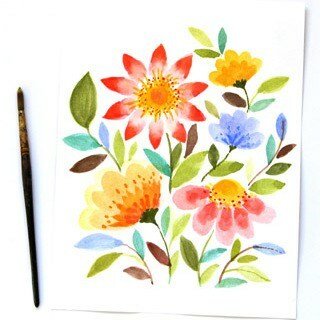 Previous Post: « Vintage French Seed Packets Wall Decor & Free Printables! Ooh, that is so fun. I love the look of it-all industrial chic. This is so interesting! 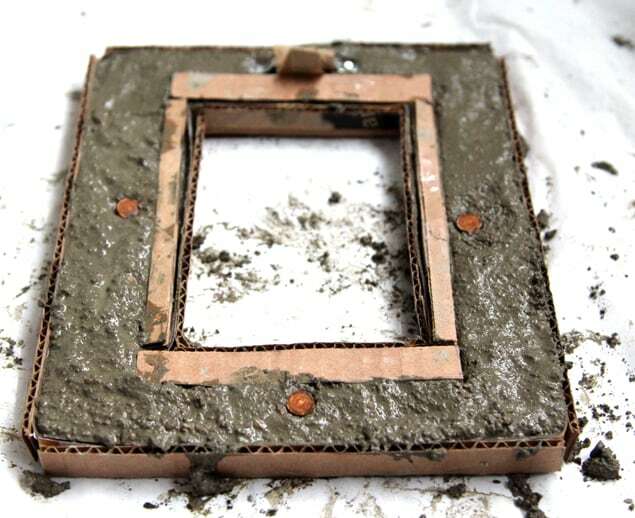 I would never think to use concrete for a picture frame. Ooooh, concrete has been calling my name and this post is pushing me over the edge. 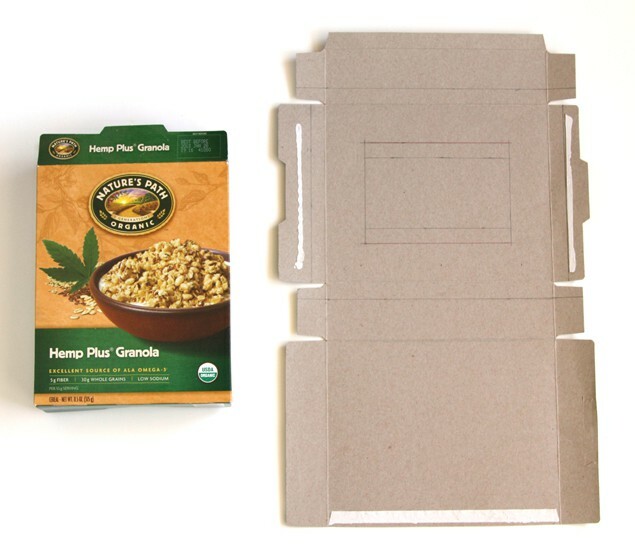 The cereal box–genius. Definitely going to have to give this a try. Thank you! This is really impressive and they look great! 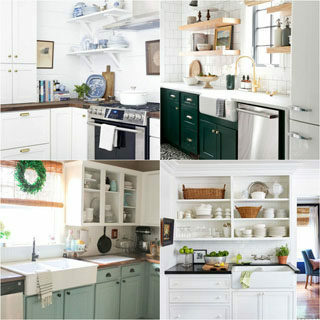 I’m definitely pinning although I’m not sure if mine will look as good ;-). This is so cool! 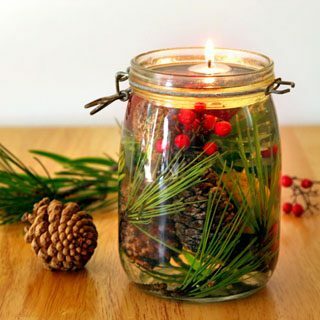 Love how rustic it looks! I like the look these concrete frames give. It makes me feel a sort of Flintstones vibe. These don’t harm your wall at all, right? Just asking because concrete can be heavy. My wife loves it when I make her homemade gifts. Well, I’ve already made a bunch of stuff for Christmas, but I found out recently that she wants a picture frame. So, with that being the case, I’m looking for ways to make her a nice looking picture frame. 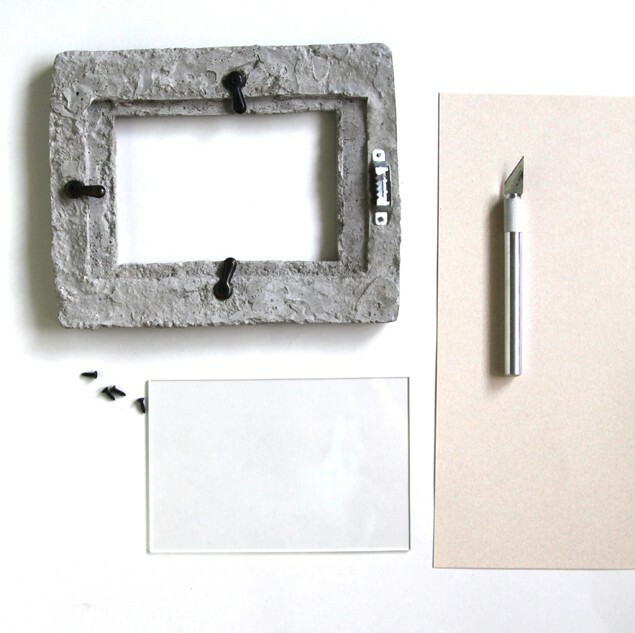 This custom made concrete picture frame looks amazing and I can’t wait to make her one. 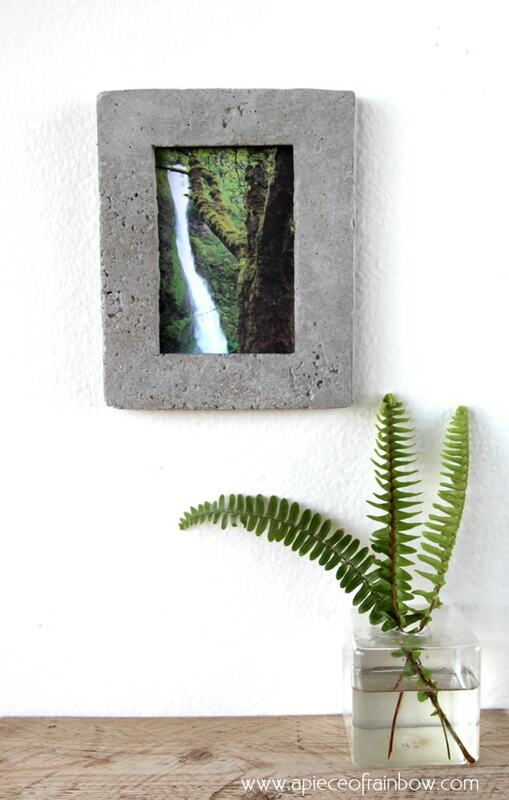 I never thought about using concrete for a picture frame before! It makes a really unique decoration when it is finished. This would be perfect for displaying the small photographs I have on my refrigerator. However, I think it might be too heavy for the large family portrait I need to have framed.